Acclaimed author Juan Gabriel Vásquez tells political stories about his country, Colombia, set in the context of personal drama. 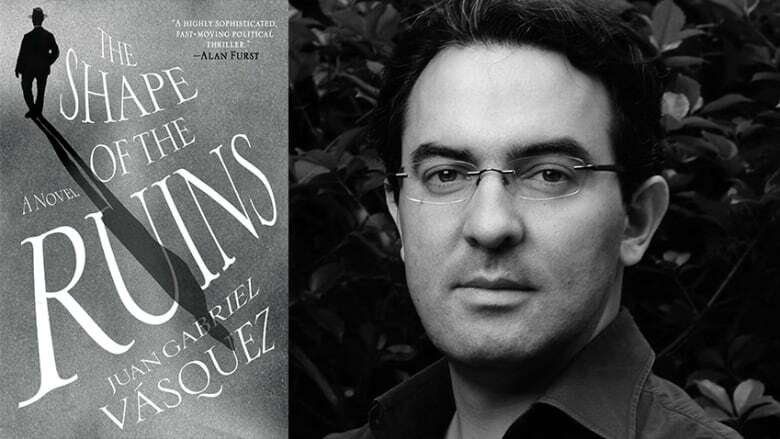 In his new novel, The Shape of the Ruins, he probes real-life political assassinations — starting with the 1948 murder of populist leader Jorge Eliécer Gaitán — through the obsessions and conspiracy theories that preoccupy his characters. Vásquez's earlier novel The Sound of Things Falling won the Spanish-language Alfaguara Fiction Prize in 2011, worth $230,000 CAD. Inspired by Colombia's narco-terrorism, it went on to win the 2014 Impac Dublin Literary Award and sold more than a quarter of a million copies worldwide. Born in Bogotá in 1973, Vásquez came of age during the height of Colombia's violent drug wars. He moved to Paris in his early 20s, and lived in Barcelona for 13 years before returning to Colombia in 2012. Vásquez spoke to Eleanor Wachtel from his home in Bogotá. "​I think the reality of the drug wars has really shaped my life. I was born in 1973. This is the year in which the DEA, the Drug Enforcement Agency, was founded. So I really saw this kind of transformation in my country. I was 11 when [drug cartel leader] Pablo Escobar killed the Minister of Justice. When I was 20 in 1993, I was almost killed by a bomb. "I've talked about this with other people of my generation and we have agreed that growing up in this very strange country — in which 24,000 people were killed every year; where we learned to live with the risk of a bombing and we made Xs with tape on our windows just in case a bomb went off nearby, so that the shards wouldn't kill us — all of this shaped us and had a very strong influence on how we developed as citizens. "I read the work of Joseph Conrad both during and after my schooling. I fell into Conrad's books in a strong way. Joseph Conrad is essentially my personal archetype of what a writer should be and do. This Conradian idea of the writer being one who goes into dark places, geographically and also metaphysically, to come back with the news — always spoke to me. "I initially didn't know how to write about Colombia. I had left Colombia in 1996 and I was still struggling with the language and the fictional strategies to write about my country. Reading Conrad made me realize how to do it. I remember reading Lord Jim and then Nostromo, obviously, as it's set in a country like Colombia. What you do is you deal with your subjects as a dark area. That means the old idea, that you have to write about what you know, is completely absurd. Not knowing something, not understanding something is exactly the best reason to write." Juan Gabriel Vásquez's comments have been edited for length and clarity.